Power cats like the Fountaine Pajot Summerland 40 are becoming the first choice for people who want to go easy on fuel consumption and still get to places in the shortest possible time. The weather on the day of our boat review is stunning. 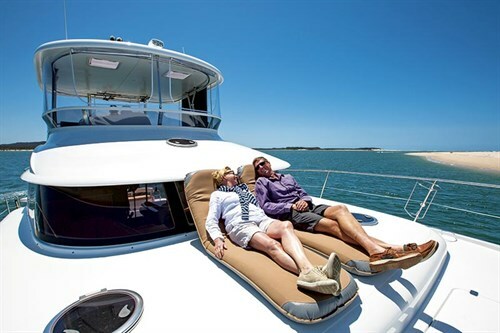 We are cruising along very comfortably aboard the Fountaine Pajot Summerland 40 to our destination, just off the Gold Coast, where North and South Stradbroke Islands meet. The channel between allows the Pacific Ocean to fill the lower portion of the Moreton Bay islands with each tide. Mellow, clear waters contrast against white sand dunes. Overhead the skies are blue and the sound of the waves breaking on the distant bar makes for a relaxing place to get to know this boat. 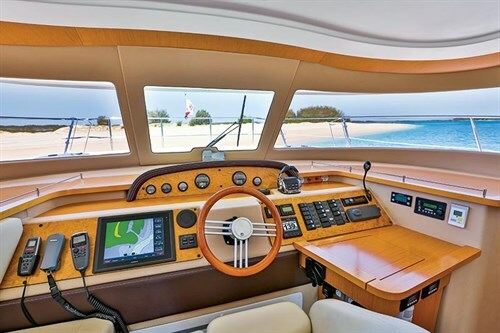 Modern construction techniques, with vacuum infusion, make powercats like the Fountaine Pajot Summerland 40 stronger and lighter, allowing them to achieve mile-eating boat speeds with smaller more fuel-efficient engines. Less money spent on engines allows a great deal more to be put into the rest of the boat, giving you more for less – more spacious living areas, greater stability, plenty of useful redundancy through duplication, and shallow drafts to get you closer to that slice of paradise. The wraparound stainless steel railings add to security at sea and run from the cockpit all the way along the wide walkaround decks to the bows and even in between. Fountaine Pajot has really tried to make it safe; whether it’s security at sea or simply having grandkids on board, the fully fenced foredeck and sidedecks will have everyone at ease about safety. The stern and transom on these boats are adaptable. Since taking delivery of this vessel the owner has added a custom swimplatform to carry his tender. For smaller tenders there is the manual davit option and some owners have chosen to store their dinghy above the cockpit on the end of the hardtop. Deck sole hatches either side of the cockpit provide access to storage. The forward end has moulded soundproof covers which, when removed, reveal an easy-to-work-around engine space. On the port side, the aft section of the test boat has hydraulic gear for the swimplatform installed. On the starboard side, a very nifty 8kVa genset is tucked in out of the way. It produces 12V supply back to the house bank for quick charging with an inverter taking care of any 240V requirements. Back on the deck of the Fountaine Pajot Summerland 40 and ascending the moulded stairs to the flybridge you are greeted with a huge 12.8m² of space. The area is rated for 10 people, which can be easily achieved with the available seating. The helm seats three and the long settee plenty more. An adaptable aft lounging area supports both seating and lounging needs. There are some customisable options for the flybridge but this standard arrangement is capable of accommodating the overflow comfortably, even if you have a load of teenagers onboard. The hardtop covering this model isn’t a standard one and although it takes a bit away from the exterior styling, it compensates with function. There is some serious stainless steel holding the insulated hardtop in place and the entire area is enclosed with vertical clears, so no space is lost to inclement weather. It is a successful way to extend the all-weather liveability from this 360-degree viewing platform. In more recent times we have seen the galley aft and alfresco blend of cockpits with saloons on monohulls. Power cats have been doing it for decades and have probably provided the inspiration for many of these recent designs. The Summerland 40 does this well. The outdoors flow inside and the adaptable doors can be positioned to maximise the flow of air over the saloon seating, bringing the outdoors in. Big windows fill this cosy area with ambient light and the decent-sized dining table directly opposite the galley is perfect for all cruising and entertaining dining options. 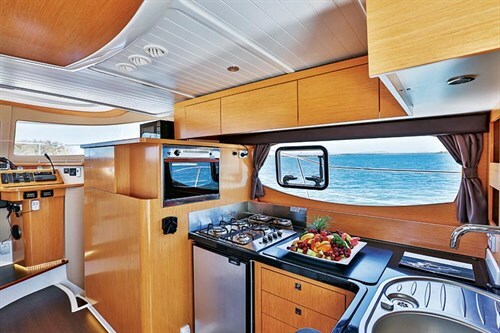 The galley is user-friendly for cruising food preparation – the four-burner cooktop and oven are gas powered for peaceful cooking at anchor, free of mechanical noise. 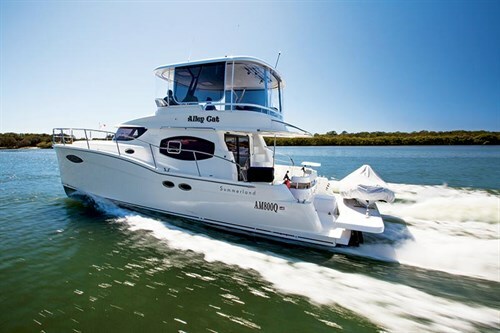 Galley refrigeration is adequate for weekends on the water but supplementing it with one of the options on offer would be advisable for cruising. Refrigeration on the newest model has been increased and some updated cosmetic changes benefit the visual appearance of this space. The high cabinetry forward of the galley and saloon has been lowered and larger windows either side of the saloon and galley have been installed giving a cleaner look. In combination with the lowered sill height of the sweeping panoramic windows forward, a greater sense of space and improved viewing for the whole interior has been achieved. Typically for a catamaran the accommodation is in the hulls, accessed via either side of the helm station. The physical separation creates just the right amount of isolation between the owner’s stateroom to starboard and the guest accommodation to port. If you are cruising the coast and guests visit for a holiday or you head out for weekends with the kids, having self-contained accommodation within each hull makes sharing the space better for all onboard. The guest accommodation is made up of two double cabins and a shared head with separate shower cubicle. Dedicating one hull to the owner’s accommodation has allowed the designers to position the island berth athwartships. This allows easy access from both sides and the raised position offers ocean views out through the portlight which will tempt afternoon readers or snoozers with fresh air and the sounds of lapping water. The cabin is well-configured for living aboard, it’s spacious with decent storage, an ample hanging locker towards the bow, a writing desk and a full-size en suite. Interestingly, a door on the aft bulkhead of the en suite leads into the utility room. The trawler-style Fountaine Pajot Summerland 40 with fine entry bows efficiently penetrates the water. The hulls are very high and look suited to offshore passagemaking, and the chines keep the ride dry as we zip over the water at 17.5kts. With the two 200hp Volvo D3 engines, we burn 42lt/h combined which seems to be the sweet spot – at this speed with a favourable sea state could get you from Sydney to Fraser Island on one tank with 10 per cent in reserve. If you tick the option to increase the range with another fuel tank, destinations you can also enjoy in winter will include the Pacific Islands. 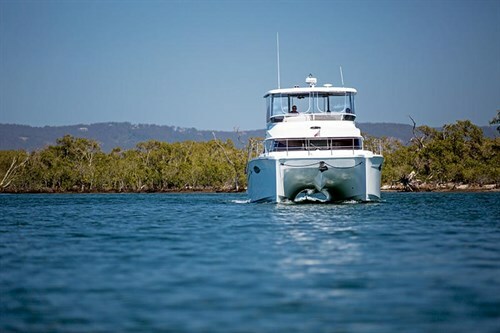 Cruising through the Great Sandy Straits, separating the mainland from Fraser Island, is done with confidence thanks to the underwater configuration – destinations like this one and the Whitsundays with its big tides, are straightforward for this type of boat. The semi-displacement hulls are user-friendly, the hulls step up over their last third creating a safer position for the props which get full protection behind the sacrificial keels. The keels are skeg-like and in the event that they do shear off, a watertight bulkhead prevents the enginerooms from being flooded. Whether it’s allowing the boat to rest on the sand between tides or exploring new places or even misjudging sandbanks, this type of setup provides the adventurer the security to explore without risk of ending the fun prematurely. The Fountaine Pajot Summerland 40 is a neat and manageable package, perfect for nautical nomads who prefer tranquil anchorages over busy caravan parks. They can affordably explore, escape and discover the coast or adventure farther afield to the Pacific Islands. It is a perfectly sized platform to spend long stints away from home as a couple or with friends and family on board. This is the type of boat that encourages you to pull the list out of the bucket and tick a few items off. See the full version of this review in Trade-A-Boat #460, December 2014 / January 2015. Why not subscribe today? Neel Trimarans upgrades its flagship model.